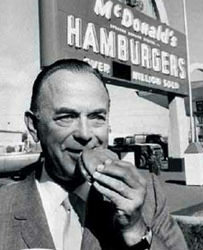 1955 – Ray Kroc opens the first McDonald’s® in Des Plaines, Illinois. 1957 – ‘Quality, Service, Cleanliness and Value’ (QSC&V) becomes the company motto. 1959 – A new McDonald’s opens at a rate of one every five and a half days. The 100th McDonald’s opens in Wisconsin. 1962 – The Golden Arches become the company logo. 1966 – Ronald McDonald® makes his first national television appearance. McDonald’s stock is listed on the New York Stock Exchange. 1968 – The 1000th restaurant opens in Des Plaines, Illinois. The Big Mac® is added to the menu. 1971 – McDonald’s opens its first restaurant in Australia. 1972 – The 2000th restaurant opens in Des Plaines, Illinois. The Quarter Pounder® is introduced. 1974 – The first Ronald McDonald House® opens in Philadephia, USA. 1975 – McDonald’s celebrates its 20th anniversary. The Drive Thru concept is unveiled in Oklahoma. 1976 – McDonald’s opens its first restaurant in New Zealand on 7 June, located in Porirua, near Wellington. 1978 – The 5000th McDonald’s restaurant opens in Fujiswawa City, Japan. 1978 – McDonald’s New Zealand opens its first Drive Thru, located in Lower Hutt, near Wellington. 1984 – Ray Kroc, McDonald’s Founder and Senior Chairman, dies and Ronald McDonald Children’s Charities (RMCC) is established in his memory. 1986 – The 9000th restaurant opens in Sydney, Australia. McDonald’s opens its first restaurant near the North Pole, with the address McDonald’s, Santa Claus Lane, North Pole, Alaska. 1989 – Ronald McDonald House Charities® becomes a registered New Zealand charity. 1990 – The world’s largest McDonald’s with 900 seats opens in Pushkin Square, Moscow. 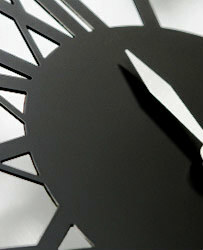 A McDonald’s restaurant now opens somewhere in the world every 14.5 hours. 1991 – New Zealand's first Ronald McDonald House® opens in Wellington. 1991 – The 150th Ronald McDonald House opens in Paris. 1991 – McDonald’s New Zealand serves its first breakfast customers in its Queen Street restaurant, and opens its 50th New Zealand restaurant in Chartwell Square, Hamilton. 1993 – McDonald’s becomes the second most recognised brand in the world. The world’s first McCafé® opens in Melbourne, Victoria. 1998 – New Zealand’s first McCafé opens in the Queen Street restaurant. 1996 – McDonald’s New Zealand opens its 100th restaurant, located in the Auckland University of Technology (previously AIT), Auckland. 1996 – McDonald’s is invited to operate the first ever branded restaurant in the Olympic Village. 1999 – McDonald’s opens its 25,000th restaurant in Chicago, USA. 2004 – The Happy Meal celebrates 25 years (1979 – 2004). Nutrition labelling is introduced to packaging on McDonald’s core menu items – an industry first. 2006 – McDonald’s launches the official worldwide rollout of nutritional information on product packaging. 2009 – Addition of Angus beef to the McDonald’s menu with the Grand Angus® and Mighty Angus® burgers. 2010 – McDonald’s New Zealand launches a free in-restaurant WiFi service. 2010 – McDonald’s goes into official partnership with Weight Watchers and launches the Weight Watchers approved menu. 2011 – McDonald’s NZ spends $150 million with local suppliers; $300 million in New Zealand supplies are also exported to global McDonald’s markets. 2012 – McDonald’s New Zealand appoints a new Managing Director. Patrick Wilson brings 27 years experience within McDonald’s, starting in the company as a crew person at age 18.